Providing you the best range of chirag brick making machine, chirag automatic bricks making machine, chirag fully automatic bricks making machine, chirag semi automatic brick making machines, chirag multi-function brick making machine and chirag raw material brick making machine with effective & timely delivery. 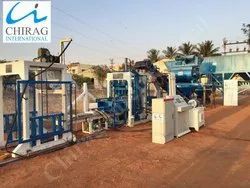 Chirag Latest Quality Brick Making Machine offered by us can be used for making all types of construction material such as fly ash brick, concrete block, interlocking brick, interlocking block, interlocking paver etc. Chirag Latest Quality Brick Making Machine This model has been applied for the patent protected by state laws, counterfeiting is not allowed (Patent No.201220242625.7). Looking for “Brick Manufacturing Machine”?